Regular exercise and getting your body moving are important to the physical and mental health of older adults. They can help maximize your ability to perform your activities of daily living and maintain your independence for as long as possible by fighting the effects of aging. Studies have shown that exercise provides many health benefits and that older adults can gain a lot by staying active. 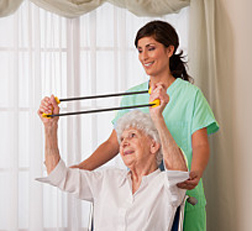 Whether you are ambulatory, have difficulty with gait and balance, or bed bound, there is a way for almost every older adult to exercise safely and obtain health benefits. 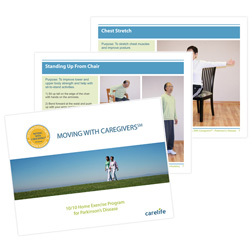 Moving with Caregivers® is a 10/10 Home Exercise Program booklet series that offers a variety of general exercises created by Carelife's Dr. Joon Park, Doctor of Physical Therapy (DPT), Neurologic Certified Specialist (NCS) and Richard Miyazato, MHA. Moving with Caregivers® is designed to help keep your body moving and improve your quality of life with a caregiver or loved one. The booklet provides a tool for caregivers and loved ones to incorporate gentle exercise into the daily routine of the person for whom your are caring. It is simple and safe to follow in the comfort of your own home. For those who require specific, personalized attention with their progressing conditions, we offer a Personalized Exercise Program (PEP); a one on one consultation by a Doctor of Physical Therapy and Neurologic Certified Specialist with expertise in a variety of neurological conditions including Stroke and Parkinson's Disease. We have served clients throughout Southern California, including, but not limited to Los Angeles, Palos Verdes, Torrance South Bay, and Orange County area. Before your begin any exercise program, you should always talk to your physician whether you have any health issues that may preclude certain kinds of activities. Your physician can determine if it is safe for you to participate in any exercise program.